In all of our work we are conscious of the very great responsibility we bear for the well being of the thousands of children who visit Burwell House. 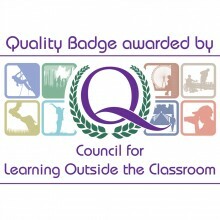 In recognition of this we are holders of the LOTC Quality badge – which demonstrates our commitment to ensuring appopriate levels of safety management, as well as the high quality of our provision. At night, visiting teachers are given the keys to the property and shown the locking up procedure – once the house is locked no visitors are able to enter it. There are interior crash bars for emergency exit. The gardens of the house, surrounded by a high wall and fence, are a safe and secure place in which the children can play take part in our activities. The Centre maintains a comprehensive fire risk assessment to ensure that we maintain the highest standards of fire safety. All residential school visitors complete a fire drill on the first day of their visit. All areas of the house are covered by a sprinkler system and a modern and extremely sensitive fire alarm system – for this reason we cannot allow aerosol sprays to be used in the house. During their stay children will complete a wide range of activities, all of which have been comprehensively assessed for the likelihood of an accident and its potential severity. We aim to minimise all identified risks and yet allow visitors the freedom to safely explore the house and garden environment. All activities are planned by experienced and trained members of staff. Any visiting leaders asked to lead an activity will be fully briefed and made aware of relevant Health and Safety issues. Our Child Protection Policy has four main elements which encompass prevention through teaching and pastoral support, written procedures and training for recognising and reporting suspected abuse, support to pupils who may have been abused and ensuring that no unsuitable persons are working with children. Through this all our staff undergoing an enhanced level DBS/CRB check before being cleared to work. All adults on site are asked to wear an identification badge and to sign in and out at reception. The Adventure Activity Licensing Regulations (updated 2004) created a licensing scheme for Outdoor Education providers. These regulations cover only the certain adventurous activities – caving, certain types of climbing, trekking (on land above 600m – i.e. not in Cambridgeshire!) and certain watersports. Burwell House offers none of these activities and we are, therefore, excluded from the scheme. Burwell House is covered by the centrally provided Cambridgeshire County Council insurance which does include public liability to a level of £50 million. This does not include Personal Accident cover or loss of personal effects or money. Group leaders are advised to seek advice on taking out an additional School Journey insurance cover. All residential children’s groups bring their own first-aid kit and include an adult who is able to take on the role of ‘first-aider’. Burwell House does have trained first-aiders on the staff, but cannot guarantee their availability 24 hours a day. Our teaching and office staff will contact the village doctors’ surgery or the ambulance service on your behalf, should this be required. During the daytime, a number of Centre staff are normally on site, and will be available to pick up course members in difficulty who are participating in off-site, Centre-run activities. Overnight, teachers are left with a mobile phone and a list of emergency contact numbers, including those for Centre staff. The Site Co-ordinator has accommodation within the grounds and will generally be the primary contact. As a County Council establishment, Burwell House has a fully prepared ‘Critical Incident Management Plan’ that should complement schools’ and other organisations’ plans.